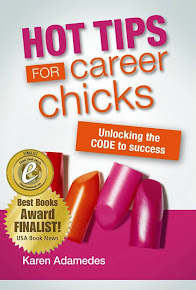 Career Chick Chat: I'm just saying...why does there have to be homework after work? I'm just saying...why does there have to be homework after work? One of the delights of finishing school was saying goodbye to homework. No doubt it served it's educational purpose but for me it was the thing that stood between afternoon tea and other "stuff" - TV, reading, talking on the phone with friends. The stuff I wanted to do. And now it seems that we are all expected to still do homework after work. In Australia yesterday Sue Morphet, the CEO of one of country's largest companies, Pacific Brands, came out talking about the need for a go-home-for-dinner culture being one of the cultural changes that could help women keep on their pathway to executive roles and stay involved in their domestic lives and responsibilities. The sentiment is excellent and cultural change is needed. But is this treating the symptom not the cause? Ms. Morphet was quoted in a number of articles as saying, "Many companies expect management to be there for such late hours. With all the technology we've got, they should go home and work on the dining room table afterwards..."
Why do we need to do homework? Why are we expecting people to work such long hours that workplace flexibility means burning the midnight oil at the dining room table? But does technology mean that we can't explore the deeper issues that are impacting the lives of workers? Can companies not afford to hire a few more people to spread the workload around? Or look at practices and processes that mean we get a hundred emails + a day? Sue Morphett hit the nail on the head when she said companies expect management to be there such late hours. Perhaps this is the cultural issue that needs to be reviewed? P.S. I think it's great that leaders like Sue Morphett are putting these issues on the table by raising them. It gives us something to think about and then hopefully, action will follow. I agree with the sentiment (work life balance is SOOO important to sanity), but also conscious the the overwhelming global culture is that of the 3 to 4 billion people in China and India who work longer and harder than any western culture (as they are actively trying to outdo everyone else). Read about how long the Chinese schoolday is if you don't believe me! Sue Morphet herself outsourced her entire manual labour workforce offshore because they could do it cheaper while hiring harder workers with less labor restrictions and longer working hours (generally speaking). While it's fine for us 20 million Aussies to talk about work/life balance and 'go home for dinner' culture, there's billions of people working twice as hard as we are to out-compete! 5 Fast Tips... to negotiate for what you need. Text is a language too ... LOL!